(NEW ALBANY, Ind. )–The IU Southeast family mourns the passing of Dr. Bernardo J. “Bernie” Carducci, professor emeritus of psychology in the School of Social Sciences. Carducci passed away on Saturday, Sept. 22 in New Albany, Ind., aged 66. Born in Detroit, Mich., and with degrees from California State University (Fullerton) and Kansas State University, Carducci came to IU Southeast in 1979 and never left, putting his unique and indelible stamp on the university he loved, and helping it to become known beyond the confines of Southern Indiana. Revered for his blazing smile, infectious laugh, cool cars and kaleidoscopic wardrobe, Carducci was a recognized expert in, of all things, shyness. And not just an expert, but an authority. Carducci authored six books and countless scholarly articles. He was a fellow of the American Psychological Association, served as president of the Council of Teachers of Undergraduate Psychology, and received two IU Southeast Distinguished Research and Creativity Awards. Most importantly, he founded and directed the IU Southeast Shyness Research Institute. Over the years, the Institute helped shy individuals build confidence and participate more actively in the world around them. One of those was Brigette Adams, faculty secretary in the School of Social Sciences. She first met Carducci while majoring in fine arts at IU Southeast in the mid-1980s. She credits him with helping her overcome social phobias; in particular his books gave her tools to help prepare for and master challenging situations. Of course Carducci attended the wedding. For Carducci, helping people overcome shyness was a mission born of his own victory over the condition. It was a mission that propelled him to seek an audience beyond academia. He appeared on ABC’s “Good Morning America,” the BBC and other national and international media, while his writings were featured in Cosmopolitan, the Huffington Post, Psychology Today, U.S. News and World Report, The Wall Street Journal, New York Times and Vogue, among many others. As he became perhaps the most well-known shyness researcher in the field, Carducci continued to identify with and shine a spotlight on IU Southeast. “He was a pillar of the campus, particularly of the psychology program,” said Gil Atnip, professor emeritus of psychology and former vice chancellor for academic affairs. Atnip had hired Carducci to bolster IU Southeast’s nascent psychology program. While Atnip and colleague Marianne Baker worked in perception, memory and other areas of experimental psychology, Carducci proved himself a dynamic instructor in social psychology, personality and other areas fundamental to the field, helping the small faculty to develop a well rounded degree. By the mid-1980s, the program had grown to over 200 majors. It has never looked back. Carducci was one of the first instructors to get students involved in actual research, Atnip recalled, a practice that has become a hallmark of academic life at IU Southeast. Numerous collaborations were published in scholarly journals, with students getting full credit for their contributions. This speaks to Carducci’s inclusive nature, according to Adams. “He was very generous with his regard,” Adams said, noting his repeated gestures of kindness and consideration that touched so many colleagues. In fact, it’s hard to find anyone on campus who has not had a brush with his personal magic. The stories are legion, with a common theme of joviality and true caring. Bernie Carducci (r) with Cliff Staten at Fidel Castro’s hideout in the mountains of central Cuba in 2011. Photo courtesy of Cliff Staten. That might have been a motto for life as well as a way to cope with shyness, describing his ability to turn interests into passions, embracing life with gusto and relishing each moment as an opportunity to share the joy of living with everyone he met. In 2011, when he learned that his friend and colleague Cliff Staten, professor of political science and international studies, would be traveling to Cuba in 2011, Carducci jumped aboard. 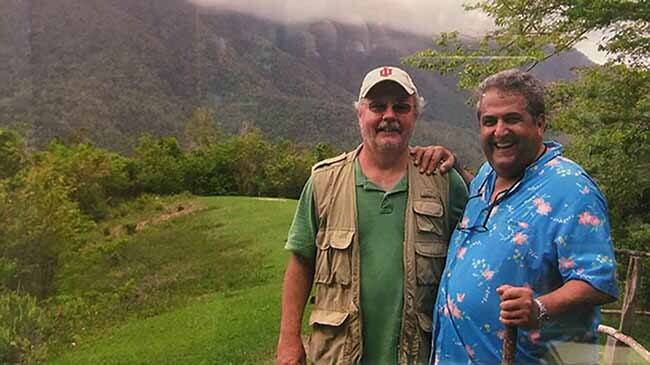 With his passion for travel, rum and cigars—he was an original member of the Derby City Cigar Club—this was a trip he did not want to miss. Carducci was a buoyant addition to the trip—and a valuable one. He led an excursion to a cigar factory, sharing a detailed connoisseur’s knowledge of the art, economics and enjoyment of this Cuban cultural treasure. As always, his lust for life was genuine and infectious. Seeing the good in everyone, encouraging to a fault, Carducci wore his very big heart on his sleeve. When it came to IU Southeast, he was an unabashed booster. His loyalty to the institution he had helped to build, and to the colleagues he had come to see as family, remained unbroken through his retirement last summer. He was in no hurry to leave, but let it be known that he was still around, still interested, still engaged. And in its openness and camaraderie, community spirit and dedication to students and their success, IU Southeast for its part bears witness to his enduring presence. 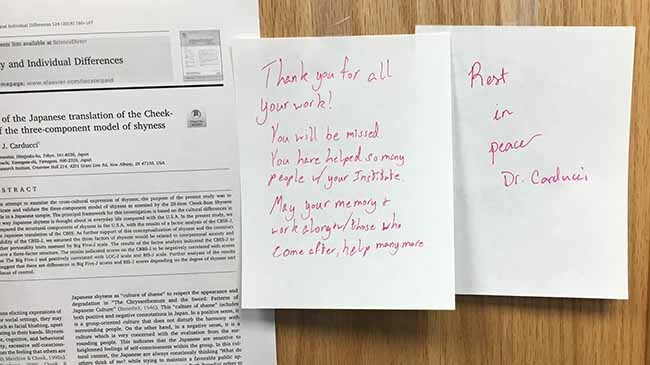 Notes posted to the door of the Shyness Institute express students’ lasting affection and gratitude. A visitation will be held on Thursday, September 27, 2018, at Kraft Funeral Services, 2776 Charlestown Road, New Albany, from 2 p.m. to 8 p.m. The funeral mass will be Friday at 10 a.m., at St. Anthony of Padua Catholic Church, 316 N. Sherwood Avenue, Clarksville, Ind. For full obituary, go to http://obituaries.newsandtribune.com/obituary/bernardo-carducci-1952-2018-1069356003 . Memorial contributions may be made to the Dr. Bernardo J. “Bernie” Carducci scholarship fund in memory of his long time academic teaching and research career at IU Southeast. Online gifts may be sent to www.myiu.org/one-time-gift noting “In Memory of Dr. Bernie Carducci” in the write-in gift area, or mail a check payable to: IU Foundation in memory of Dr. Carducci, c/o IU Southeast, Office of Development, 4201 Grant Line Road, New Albany, IN 47150.